Eurydice Lang is an instructor at Louisiana State University Health Sciences Center School of Nursing. She received a Bachelor of Science in Chemistry/Pre-Med from Xavier University of Louisiana, an Associate of Science in Nursing from Delgado Charity School of Nursing, and a Master of Science in Nursing Education from Louisiana State University Health Sciences Center School of Nursing (LSUHSC-SON). 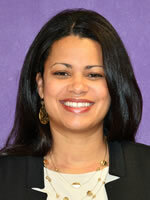 Eurydice is currently enrolled in the Doctor of Nursing Science Program at LSUHSC-SON. Ms. Lang is a certified lactation counselor (CLC). She is a member of Sigma Theta Tau’s International Honor Society for Nurses, Southern Nursing Research Society, Association of Women’s Health, Obstetric and Neonatal Nurses, and Greater New Orleans Breastfeeding Awareness Coalition. She currently serves as a course faculty member in Women’s Health and the course coordinator of Perspectives in Professional Nursing for the undergraduate nursing program. Eurydice was the recipient of the Sister Henrietta Guyot Award (2018), the School of Nursing's Nursing Caring Award for Faculty (2016) and nominated for the Daisy Faculty Award (2016). Ms. Lang has experience in labor and delivery, acute care, and home health nursing.